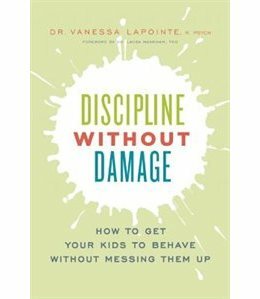 I recently purchased and read the book "Discipline Without Damage" by Dr. Vanessa Lapointe. A few months ago, I realized that we spent a lot of time yelling at E and I thought there must be a better way. The main theme in our "discussions" with him were about listening and doing what he is told the first time, rather than having to be asked several times. Other than that, he is a pretty well behaved and always happy boy. I liked what this book had to say, and although there are still times we yell at him, I do think the book has reduced that and has provided some strategies for us. The author is Canadian, which I liked; she is a child psychologist in British Columbia. She has her own children and admits that even she, as an expert in the field, still slips up and yells and says things she wants to take back. It was a pretty easy read, although it is still a self-help book and it's not like I couldn't put it down. I would usually read a few pages at a time and it took me about a month to finish it. While reading I dog-eared some pages and then when I was finished, I went back and made reading notes, just like I would have done in university. This helped me to provide an overview to Dave and also remind me of the salient points. As an introduction, I was reminded that children's brains are not fully developed; they do not reason like adults, they simply react to the situation. Sometimes we think that they are misbehaving on purpose just to bug us, but that simply isn't true. If a child was physically hurt or ill, we would tend to them with patience and care; we should treat their mental/behaviour anguish in the same way. Also, when a baby is upset, we simply tend to their needs, we don't expect them to figure it out on their own, like we sometimes expect of older children. The main concept in the book is that children just want to feel connected to the "big people" in their lives (parents, teachers, leaders, etc. ); it is when they start feeling disconnected that they flail about (sometimes literally) and need to be brought back to regulated behaviour. I've never believed in a time out where the child was sent away to their room (although we have done it sometimes when we have felt extra frustrated). This book supported that position because being sent away just enforces the feeling of disconnect between the child and the big person (usually the parent) and even when they rejoin the group, sometimes they are only doing it to gain favour rather than actually learning their lesson. It's better to be physically comforting while the child is upset/deregulated, recognize their feelings, and then have a quick conversation about how to behave the next time after they have calmed down. Another point that I liked is for the parent to "be the Hulk" in the relationship. Kids want and need the big people in their lives to have everything under control and provide the care for them. When they start thinking that the big person doesn't have it all together, then they start to panic, become deregulated and then "misbehave". (Side note, misbehaviour is really just a away to get out sadness and anger.) Sometimes you need to fake it because you don't have it altogether, but if you can keep it simple with a hug, an arm around them, or saying "we're okay, we will figure this out together", then it can help to provide the stability that the child needs. Once they feel safe and stable, even when they get upset, then they can start responding to stressful situations in a more settled manner. You may think this is a bunch of hooey, as I sometimes do, but it is a strategy that may work for you and if you think it will, then pick up the book. Here is a link to it on Amazon here and on Indigo here. I have really only just touched on the information in this book; there are many good examples showing why a certain response is better than others. It also gives you a step by step list of how to react to a "deregulated" child and other strategies. Good reminder about child development....especially when a child learns so quickly we forget they are not fully developed in logic and rational thinking. Also, I like the advice to be physically comforting when a child is upset rather than send them to their room. But true it is a challenge to keep calm ourselves in an upsetting situation and be the Hulk as you say. It sounds like a good book. And no one gets it right all the time. But striving to do better all around is a good life goal.